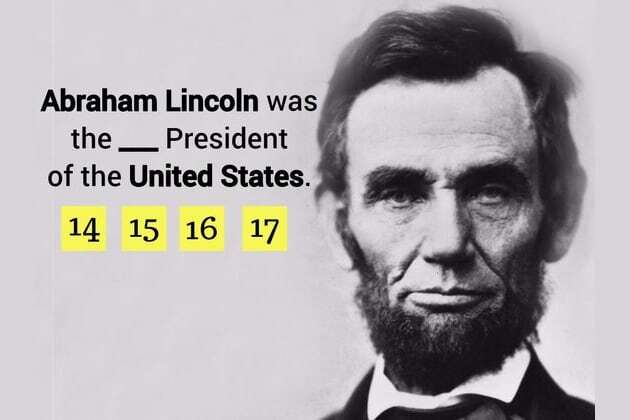 Abraham Lincoln was the ___ President of the United States. And what was the turning point in the Civil War? Which amendment guarantees citizenship to all people born in the United States? Who is considered to be the 'Father of the Constitution'? When was Jamestown, the first permanent English settlement, founded? What did the 'Magna Carta' limited? The power of the ruler. The rights of the citizens. The responsibilities of the Supreme Court. Which amendment states that Congress shall make no law restricting freedom of speech, religion, press, assembly, and petition? A change from household industries to factory production using powered machinery. An economic theory that a country should sell more than it buys. A revolution that forced Britain to recognize the United States as an independent nation. What was the 'Temperance Movement' campaigning against? Ulysses Grant was the ___ President of the United States. A system in which each branch of government has its own powers. Rights that cannot be given up, taken away, or transferred. Belief that the United States should own all of the land between the Atlantic and Pacific Oceans. Which amendment guarantees the right of individuals to bear arms? People opposed to the Constitution. 'Federalists' favored a strong national government. You nailed it!! You IQ score is 152 or higher!! Your IQ is truly phenomenal. You think logically and strategically, you love history and geography, and you enjoy travelling by yourself. Happy forth of July:) Don't forget to share your score with every American you know. You're definitely NOT a genius. Try again, and share the quiz with every American you know. Happy 4th of July! !